Did You Know: Healthy Employees Are More Productive? Think about how you feel when you are in the habit of eating well and exercising. You feel more energetic, more creative. You probably have more drive and focus to get things done. And, you likely enjoy doing those things as well. Now think instead about how you felt the last time you were sick. You probably didn’t want to get out of bed, never mind do anything on your to-do list. If you even went to work, you were probably distracted, unfocused, and miserable. Wellness in the workplace, of course, is much more than simply not getting a cold or flu. Positive habits like exercise, eating well, and others lead to more comprehensively healthy employees. And healthy employees are more productive, both individually and as a group. Wellworks For You wants to help you and your business realize the full benefits of this fact by facilitating wellness in the workplace! 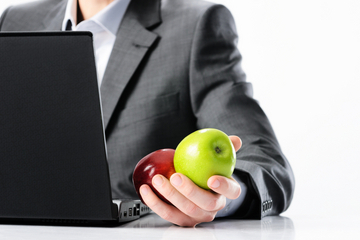 A recent CDC report confirms this fact: companies with healthy employees are more productive. First and foremost, healthy employees are less likely to miss work, leading to fewer sick days and also a more complete team working together on any given day. Even if unwell employees do decide to show up, their productivity is greatly affected by their level of health. Healthy employees tend to more focused, energetic, and creative than those who are currently sick or simply leading an unhealthy lifestyle in terms of diet and exercise. Of course, once you know that healthy employees are more productive, you don’t want to leave their wellness to chance. A health and wellness program in the workplace can make a significant difference in the lives of each and every participant. Whether you choose a pedometer challenge to get folks moving or individual health coaching to meet more specific needs, these programs have a proven return on investment. When you decide to make positive changes in the wellness of your employees and company, you are not alone. Wellworks For You has a wide range of customizable programs that are easy to facilitate. Our proprietary platforms seamlessly blend the best of technology and wellness practices in order to create an engaging and effective program. Contact us today for more information about the benefits of corporate wellness programs and how you can start working toward a healthier, more productive workplace today.